Poet Hovhannes Shiraz, one of the most popular names in Armenia and the Diaspora during Soviet times, was born in Alexandropol (later Leninakan, now Gumri), in 1915. His birth name was Onik Karapetian. At the age of five, he lost his father, who was killed in the Turkish invasion of Armenia that followed the Armenian-Turkish war of 1920. He grew in poverty. He went to work at the textile factory of Leninakan in 1932. He published his first poems in the factory newspapers. Apparently, he first signed them with the pseudonym Hovhannes Shirak (Gumri is located in the plain of Shirak). One year later, he was hired as teacher in the village of Haji Nazar (now Kamo), in the district of Akhurian. He published his first book of poetry, “Spring Initiation,” in 1935, with the pseudonym Hovhannes Shiraz. According to his testimony, writer Atrpet (1860-1937) gave him the pseudonym of Shiraz (a city in Iran, well known for its flowers), saying: “The poems of this young man have the perfume of the fresh and dew-covered roses of Shiraz.” In the same year, Shiraz became a member of the Writers Union of Armenia. He attended the Faculty of Philology of the Yerevan State University between 1941 and 1947, where he studied Armenian language and literature. Afterwards, he lived from his pen. He also followed the courses of the Institute of Literature Maxim Gorky of Moscow from 1952-1954. Shiraz’s most important collection of poetry was “Lyre of Armenia” (three volumes, 1958, 1965, and 1974). He won the State Prize of Soviet Armenia in 1975 and the Hovhannes Tumanian prize in 1982. He was never allowed to travel outside the Soviet Union, but many of his unpublished poems were smuggled outside the country and published in the Diaspora press. For instance, the first draft of his poem “The Armenian Dante,” about the Armenian Genocide, was written in 1941. Only a few excerpts were published in Armenia during his lifetime and a few chapters in Beirut and Tehran. The entire poem was posthumously published in 1990. His poem “Ani,” about the medieval capital of Armenia, written in 1950, was also published in excerpts in the Diaspora, and the final edition only appeared in 2012. A behind the scenes shot of the making of the film, Shiraz, in Gyumri, in 1983. Hovhannes Shiraz is second from left, sitting in the carriage. In the first decade and half of the twentieth century, poet Taniel Varoujan rose to become the most remarkable name of Armenian literature. He would have become an internationally known name had not his exile and assassination trounced his career during the Armenian Genocide. Taniel Chibukkiarian was born in the village of Perknik, in the vilayet of Sepastia. After attending the local school, in 1896 he went to Constantinople, where he attended one of the schools of the Mekhitarist Congregation of Venice. He then continued his education at the Moorat-Raphaelian school of Venice from 1902-1905. In 1905 he entered the University of Ghent, in Belgium, where he followed courses in literature, sociology, and economics. He adopted the surname Varoujan (from an Armenian word that means "male dove") when he started to publish his poems. In 1906 he published his first volume of poetry, Shivers, followed the next year by a booklet that contained a long poem, The Massacre. He graduated in 1909 and returned to the Ottoman Empire. The same year he published a new volume, Heart of the Race, which established him as a poet. Returning to Sepastia, he became a teacher between 1909 and 1912. In 1910 he married his student, Araksi Tashjian, vanquishing the opposition of her father. In 1912 they moved to Constantinople, where he became the principal of the St. Gregory the Illuminator School until his deportation in April 1915. He published a new and even more powerful collection of poetry, Pagan Songs, in 1912. In late 1913 he joined forces with four young writers, Kostan Zarian (1885-1969), Hagop Oshagan (1883-1948), Kegham Parseghian (1883-1915), and Aharon Dadourian (1888-1965), to create the group "Mehyan." They issued a manifesto that called for the renovation of Armenian literature and language, and founded a short-lived but important monthly journal, Mehyan, that published seven issues (January-July 1914). Due to aesthetic divergences, Varoujan left the group after the third issue (March 1914). The poet had three children: Veronica, Armen, and Haig. His wife was pregnant with their third child, when Varoujan was included in the Turkish black list and arrested on the night of April 23-24, 1915, by the police with hundreds of Armenian intellectuals and leaders. He was deported to Changr (Chankiri) together with many of his colleagues, where they lived in a sort of internal exile for the next two months. On August 26, 1915, along with his friend, the poet and physician Rupen Sevag (Chilingirian, 1885-1915), and three other Armenians, they were taken to Kalayjek. On the road, following a previous plan, a group of Turkish chetes (irregular soldiers) attacked the carriage that transported them. They were forced to take their clothes out, and then savagely assassinated. The same day, Varoujan's son, Haig, was born in Constantinople. The poet's papers had been confiscated at the time of his arrest. In 1921 his wife Araksi was able to recover, after paying a hefty bribe, his unfinished last book, The Song of the Bread, which was published the same year in Constantinople. After his death, Varoujan's works were published in no less than thirty editions over the past nine decades. Collections of his poetry have been also published in French and Italian. His daughter Veronica Safrasian (1910-2009) lived for many years in New York, while his younger son Haig (1915-2002) passed away in Fresno. The reason for these arrests was that on April 17, a double “political murder” had been committed. Two of the main Turkish executors of the Armenian genocide, Dr. Behaeddin Shakir, a member of the Committee of Union and Progress (Ittihad ve Terakke) and head of the Special Organization (Teshkilat-i-Mahsusa), and Jemal Azmi, former Turkish governor of Trebizonda, were passing through Uhlandstrasse, a fashionable district, with their wives and the widow of Turkey’s former Minister of Interior, Talaat Pasha (assassinated in March 1921 by Soghomon Tehlirian), when “two slim, undersized, swarthy men lurking in a doorway rushed out, thrust the women aside and fired several rounds pointblank at the two objects of their vengeance and made their escape under cover of revolver fire which was directed at the Turkish party by confederates across the street,” the newspaper added. The police had offered an unusually large reward of 50,000 marks for the apprehension of the killers. However, they were not found, and the fifteen arrested Armenians were released. The German police were on the right track, but were unable to follow through. The “secret murder organization” directed from America was in charge of Operation Nemesis, that was created by the Ninth General Congress of the Armenian Revolutionary Federation in Yerevan (1919) to liquidate the chief Turkish leaders responsible for the Armenian Genocide. The details of the operation and its various ramifications, from Constantinople to Rome and from Berlin to Tiflis, started to come to light some thirty years later, in the memoirs of the commandos who were entrusted with the mission. Their identity and the code name of their operation would become more widely known after the publication of Operation Nemesis by the French journalist Jacques Derogy in 1986. It was published in English under the title Resistance and Revenge, in 1990. The two so-called “swarthy men” entrusted with the second Berlin operation were Arshavir Shiragian (1900-1973) and Aram Yerganian (1900-1934). In March 1920, Shiragian had assassinated Vahe Ihsan (Yesayan), an Armenian informant who had helped draw up the list of prominent Armenians arrested and deported in April 1915. He followed up with the assassination of Said Halim Pasha, former Great Vezir of the Ottoman Empire, in December 1921. In June 1920, Aram Yerganian assassinated Fatali Khan Khoyski in Tiflis, former Prime Minister of Azerbaijan, who was mainly responsible for the Baku massacres of September 1918. In Berlin, Shiragian’s fire killed Jemal Azmi and wounded Behaeddin Shakir, and Yerganian finished the job. After disappearing from the scene, the Armenian avengers took different routes and had quite divergent fates. Aram Yerganian moved to Austria, Bulgaria, and Romania, and finally settled in Buenos Aires (Argentina) in 1927, where he married and had a daughter, Maria. He continued to be actively involved in public life, but nobody knew at the time about his exploits. He contracted tuberculosis in 1931 and moved to the Argentinean city of Cordoba looking for a cure, but passed away three years later at the age of 34. His memoirs of the operation, «Այսպէս սպաննեցինք» (“We Killed in This Way”), were posthumously published by Shahan Natalie (1884-1983), one of the main organizers, in 1949. In 1959 Yerganian’s remains were exhumed and reburied at the A.R.F. “Antranig” Club of Cordoba. Arshavir Shiragian married and moved to New York in 1923, where he had a daughter, Sonia. He also was active in public life in the New York/New Jersey area. He published his memoirs in 1965 with the title «Կտակն էր նահատակներուն» (“It Was the Legacy of the Martyrs”), later translated into French (La dette du sang, 1982 and 1984) and into English (The Legacy, 1976, by Sonia Shiragian). In his later years he was recognized and honored as a national hero. He passed away in 1973 and was buried in New Jersey’s Hackensack Cemetery. The death of Khoren I, Catholicos of All Armenians, on April 6, 1938, was the climax of the struggle of Communism to wipe out the Armenian Church from Soviet Armenia. Alexander Muradbekian was born on December 8, 1873 in Tiflis. He graduated from the Nersisian Lyceum in 1892 and continued his studies in Switzerland. In 1897 he became a teacher of vocal music at his alma mater. A few months after being ordained deacon in 1901, he took the vow of celibacy and was ordained vartabed in 1902. In between, he had been designated reformer of the churches of the region of Nor Bayazet (now Gavar). In June 1903, he resisted the confiscation of the properties of the Armenian Church by the Russian government and was arrested and exiled to Orel, Russia. He returned from exile in 1905 and was named diocesan vicar of Gori-Imereti-Batum and Ardvin. A patriarchal encyclical by Catholicos Megerdich I Khrimian designated him reformer of the churches of Nor Bayazed and Darachicak (now Tsaghkadzor). He was elevated to bishop in December 1909. He served as the president of the Committee of Brotherly Aid during the years of World War I, and organized assistance for wounded Armenian soldiers and refugees. Bishop Khoren Muradbekian took the initiative of founding the Armenian National Council in Yerevan in 1917. By arrangement of Catholicos Kevork V Sureniants and order of the government of the Republic of Armenia, he went to Paris in 1919 as the Patriarchal Legate to settle the differences between the two Armenian delegations that participated in the Peace Conference (Delegation of the Republic of Armenia, led by Avetis Aharonian, and Armenian National Delegation, headed by Boghos Nubar). In 1920 he traveled from Paris to the United States to resolve the discord in the diocese of America. He organized a fundraiser for the defense and reconstruction of the Republic of Armenia, and arranged for diocesan elections. 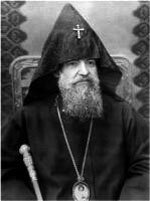 In 1921, Archbishop Tirayr Der Hovhannisian was elected primate and served until 1928. Bishop Khoren was given the title of Archbishop in December 1920, and designated chairman of the Supreme Ecclesiastical Council of Holy Etchmiadzin and locum tenens of the Catholicosate of All Armenians. He challenged the group called “Brotherhood of the Free Church,” which under the pretext of church reformation served as a tool of the Soviet Armenian regime. 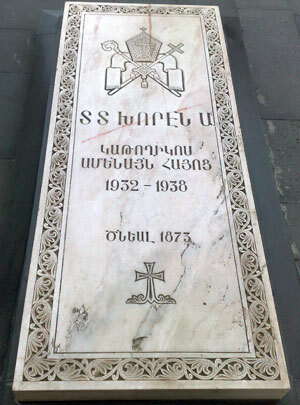 After the death of Kevork V in 1930, Archbishop Muradbekian administered the Armenian Church for two years. The National Ecclesiastical Assembly elected him Catholicos of All Armenians on November 12, 1932. Catholicos Khoren I struggled valiantly to reopen the churches closed by the government, to stop the destruction of churches and their use for non-religious purposes, and to prevent the persecution of Armenian clergymen by the Soviet authorities. He also dealt with various issues regarding the statutes and the organization of the Church, as well as its rites. He worked to ensure a closer relationship between the hierarchical sees of the Armenian Church. He also organized the commemoration of the 1500th anniversary of the translation of the Bible (1935). The Soviet regime was implacably moving to end the existence of the Armenian Church in Armenia. Churches were confiscated, closed, and destroyed; priests were arrested, tried, shot, or exiled with various excuses; the Holy See was being subjected to mounting political, financial, and social pressure. Under these constraints, Catholicos Khoren I passed away suddenly on April 6, 1938, in his residence at Holy Etchmiadzin. The circumstances of his death were mysterious enough to suggest foul play. While the official conclusion was that he died of a heart attack, the brevity of information about his death and various unofficial testimonies strengthened the belief that he died at the hands of the Soviet secret police. 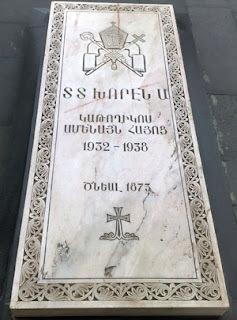 He was buried hastily, and four months later, on August 4, 1938, the Bureau of the Central Committee of the Communist Party of Armenia decided: “Taking into consideration that available materials reveal the active struggle of the Catholicate of Etchmiadzin against the Soviet authorities and the Armenian people, to shut down the monastery of Etchmiadzin, and turn it into a museum; to deny authorization for the election of a new Catholicos, and to liquidate the Catholicate of Etchmiadzin, the center of Armenian ecclesiastics.” A letter in this regard was sent to the Soviet strongman, Joseph Stalin, for confirmation. For one reason or another, the decisions were never put into practice. Archbishop Kevork Chorekjian, one of the few surviving high-ranking ecclesiastics, was named locum tenens. In 1941 he arranged for the remains of the unfortunate Catholicos to be buried near the main door of the Monastery of Saint Gayane. Fifty-five years later, in 1996, when the Soviet regime no longer existed and Armenia was an independent country, by order of the newly elected Catholicos of All Armenians, Karekin I, the remains of Khoren I were reinterred in the courtyard of the Cathedral of Holy Etchmiadzin.